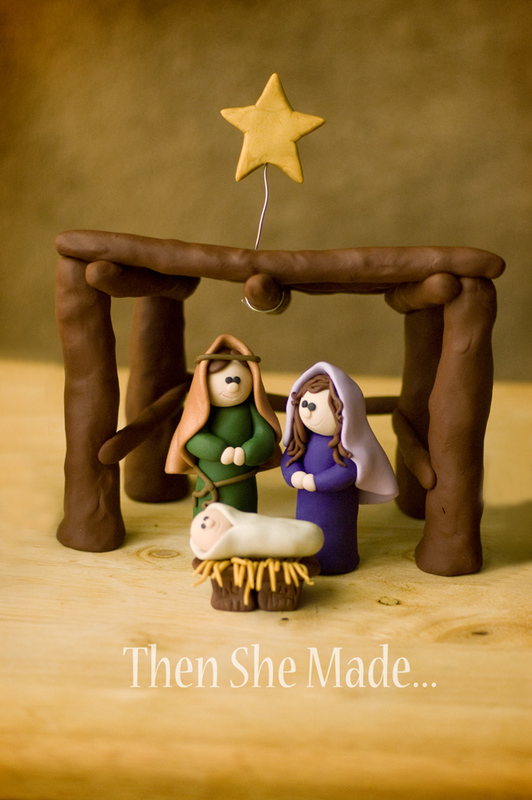 Then she made...: Holy Family Giveaway - Yes? Please note, on Jan. 15, 2013 - Feedburner had a hiccup and sent this post out to all my subscribers. I got in my inbox too and what quite surprised. Needless to say, if you are reading this post now because of the email please know the giveaway has ended and already been awarded! Holy Moly! I'm feelin' pretty dang happy right now. This news totally made my day. So much so that I'd like to pass along the happiness! So, as I'm sitting here working up the tutorials for our last few pieces of our nativity: Joseph, Mary and Baby Jesus, I just thought "hey, I should give this away!" You guys have followed along with this Nativity project all year. You've read the tutorials, and some of you are doing them. You've pinned it on Pinterest, shared it with your friends. You've emailed me questions, you've sent me pictures of your creations and well, you've been patient with me when I've been slow to post and you were even supportive this past summer when life derailed my plans and it all means a lot. So, as a thank you I want one of my readers to have this. Q: What types of things would you like to see more of on Then She Made in 2013? And, be sure that you leave a way for me to contact you. If your comment gets picked but there is no contact info, another winner will be chosen. I will keep this open for one week, all comments need to be made by Friday, November 16th, 2012. Thank you all again! I love my readers! I am currently on the quest figure out Thanksgiving decorations, and Easter, too. This nativity set is so stinking cute, I hope to make one some day -- but the stable and holy family would be a start! I love all of your lovely creations! I would love to have a Nativity of my very own made by you! I would love to see more of the same :-) I love the jewelry and all of the clay creations. I had not worked with clay before and since finding your blog I have made myself some jewelry! Very cool! I LOVE your nativity!!! In the future, I'd love more thanksgiving decorations and easter too! Would love to see more jewelry projects and maybe kid friendly projects! Your nativity set is gorgeous! Would love to win this for our little six year old...she has a small nativity set that she refuses to put away after the holidays...says she can't put baby Jesus in a box for the rest of the year! So she is probably the only little one I know who has her ragged little set on her dresser 365 days a year! Thanks for a fun giveaway and for sharing on your blog! Would love to win this beautiful holy family set made by you! Would love to see more jewelry you make with your girls. As a mama of four girls I'm always looking for beautiful things to create with them and you sure make beautiful things!!!! Thanks for the opportunity to win your beautiful giveaway!!! I love all the nativity you make. Maybe do something with Easter with fun colors, maybe something for new mothers. I am always on the lookout for cute Pregnant moms to be. I love your blog and am doing the nativity with your tutorials. (I sent my pic in). I have a love for salt dough. I would love to see some ornamnents, basket fillers, etc. Thanks for such a great blog! I love seeing your crafts and the tutorials to make them. I would love to win The Holy Family set. I've enjoyed reading every tutorial on the Nativity set tis year. I would love to win The Holy Family! It is super cute! I love your craft posts with tutorials. I love to make things whenever I can and you have such wonderful ideas. I enjoy seeing what you are up to. Thank you for sharing. You all ways inspire me to try things I may not be comfortable doing and looking at things in new ways. That is what I would like to see more of in 2013. The nativity is great. I have collected them since I was a girl. Even had a little one that glowed in the dark, lol. Holy Family Giveaway - Yes? YES!!! I love this Nativity series. I have all the supplies and WILL be making them, it will probably be a couple weekends' project, but it will happen! What would I love to see more of in 2013? I would have to say MORE OF THE SAME! As a Pastor's wife and stay home mom of 4, I LOVE your budget minded crafts with such clear tutorials which make me think, "I CAN do that!" and half the time I DO!! I just made the giant black spider for our Trunk or Treat event at church. She was so cute, my 10 yr old autistic son-who has an irrational fear of spiders (real or fake)-wasn't afraid of her! I love that everything you post does not seem impossible to this "crafter". More holiday items would be great, and the ideas that you post for teenagers to create make our house really happy. I love the nativity set - so stinking cute! I like projects that have a practical use, like the soda box turned into soup can storage. Then again, I do love the nativity project. Maybe another style next year? I love your blog!! I like to see all the cute things you come up with so can't say what I would like more of. I love looking at the crafty stuff, you are so creative. But to be honest, I never do any of th r crafty things. I like to cook and have made several of your recipes. We love the frozen pudding sandwiches. And the green olive cream cheese spread is absolutely delicious! I eat way more of it than I should. So I would like more yummy recipes! I would love, love, love to win this. I enjoy your blog so much. I would like to see more craft ideas for my sunday school class. I teach 1st-3rd grade and have made crafts at the end of the class. some of the ideas in our teacher book are sort of lame...but most can be tweeked to be better when you have another craft idea to combine with the original one. Anyway, thanks for your blog and enter me in the giveaway! Loved your haloween decorations last year and love to see more jewelry. WOW! I never thought I would be able to try and win this. I have looked and watched and admired all along but have not attempted it. Your nativity pieces are adorable! I love your necklaces / pendants and wouldn't mind seeing more of those creations. Keep up the great work! I love the mix of articles on your blog, but I particularly like your projects. Like you, I am happy creating, and your ideas are inspiring. I collect nativity sets and handmade ones are the best! I just love this nativity set. I want to thank you for the tutorials and all the wonderful ideas you present to us. Don't change a thing. SO SWEET!!! Love the nativity! I'm fairly new here, and I love so many different things that it's hard for me to say what I'd like to see more of in 2013. I guess I'd have to say just more DIY projects in general. I, too, love your nativity scene. But I got so tickled by something as simple and cute as your ghost. So I would enjoy seeing simple ideas for different holidays, seasons, events. I could see an adorable rabbit from you, an american flag, etc. An example is your camera. It's adorable - perfect for a photographer, so maybe ideas like that. I'm always looking for the perfect necklace to give my daughter to represent her family. Anyway, you go girl. I love your Holy family! I would have liked to make the whole set but haven't worked with clay before. Perhaps if I had a start I would go on to make the rest. You're so creative and make the cutest things. Just keep on doing what you're doing! I am excited to explore more of your site. Thanks! More holiday postings is what I'd like to see. LOVE this Nativity and would love to be the one picked to win it! I love nativity sets! Yours is so very cute. Something I would like to see more of in 2013...hum, haaaahhhaaa, why do you think you have 6000+ followers! We depend on you to think of fun things! This is adorable. Beautifully done. I'd like to see more Christmas things to make, especially ornaments. This nativity is adorable. Love your blog and the many different craft ideas I can find. Keep doing more of it in 2013! The nativity is my favorite, both the large set and small set. They are adorable. Continue with the clay and gift ideas using recyclable items. I hope to win the cute nativity set. Oh my gosh! I tried to make these, but my people/animal molding skills just stink! lol I love your site, and I am always checking to see if you've posted something new. I'd love to see more gift ideas. You're so creative with them! And I'd also like to see more of what your kiddos are working on! Seems like they all got the crafty bug from their momma! Thanks so much! I love your clay creations. I'd like to see more ways to make jewelry with it. Thanks for great step by step tutes! Beautiful work! Love the nativity!! All of your work is beautiful! Looking forward to seeing what else you come up with! I love your nativity! That is one of my favorite decorations to put out at Christmas time. I like seeing posts for holiday and DIY projects. I like crafts my kids can do with me. I love everything you do. Thanks for the chance to win. I just love to read your blog every day, your email comes and I can't wait to see what you have for us today. I really don't get time to do crafting like you do, but your creativity flows right off the the blog and your site. Whatever you choose to do in 2013 is fine by me. I will always come back to see how you did that or what to do for this! Thank You! I love your blog, and this is one of the sweetest projects I've ever seen! I love Nativities. I'm a YW leader, and I'd love a cute craft idea that we could make together that goes with next year's theme "Stand Ye in Holy Places". Any ideas or tutorials would be GREAT! Thanks so much! OOooh I just love this and I'm happy for a chance to win. I always enjoy seeing your necklace pendants, so I'd love so see more of those in 2013. I would love to win this!! I enjoy all your posts, but would love more on Christmas decorating ideas/tutorials. I've just discovered your blog and love your nativity! I collect nativities to display at Christmas and think this would be a fabulous addition. Since I haven't been here too long, I can't say what I'd like to see more of, but I CAN say that I like what I see! I'm interested in learning how to repurpose items and upcycle into cool jewelry and home decor. Love your blog. Thanks for all you share with us! I cannot say how much I love these nativity tutorials. Thank you for sharing them with us, and with such detail to boot! I would love to see more tutorials of this nature, but specifically what about a resurrection scene. If we use a nativity scene, I think a resurrection one would be a nice tradition as well! Thank you for all your great tutorials! I love the simplicity and look forward in seeing what your creative mind comes up with next! Love the nativity! Nativities hold a special place in my heart! I'm a new follower so I haven't seen all of the things you post about so I'm just looking forward to your creativity. Hello! I love how you take common items and turn them into amazing things- like the snowmen out of mentos gum and socks, the bunny out of a gum container, and a pumpkin out of a roll of toilet paper. I'd love to see more!!! Your nativity set is beautiful! I would like to see ways to use up the mass of scrapbook paper I have accumulated! Thank you for all the Nativity tutorials. I've saved them all up and plan to start mine in January. (This year was just way too busy!) I'd love to see some papercraft ideas and ways to use rubber stamps other than just stamping. Thanks for the giveaway! Your Nativity is SO cute!! I would love to win!! I am always on the lookout for holiday decor and would love to see your ideas! I would love to see more items using "around the house" items. I Love the snow people made from socks and rice! Easy and cute. Something for any season. I love this little set and your tutorials are awesome! So far I've enjoyed all of your posts and really wouldn't change anything. You have such cute thoughts and ideas to share! I really like seeing all of the jewelry that you've made - so I vote for seeing for more jewelry making in 2013! I love this nativity! I would like to see more jewelry how-to's, I love your pieces! I know I missed this by a day... but I have to say that I LOVE this nativity set, and hope one day to make it for myself (tough health times right now, cannot concentrate enough for such fine detail work). Just love to see more of the same-- fimo dough projects, and anything else you like to do! Brava, keep it up! I'm coming rather late to the party as I only happened across this blog yesterday. I really love your nativity characters and am going to give them a go with my toddlers next week - would home made modelling clay work? I'd like to see the remaining nativity tutorials with the addition of an ox and angel, perhaps? Okay I'll bite was this a mistake? The dates kind of threw me.However love love love this nativity.